Digital printing and direct mail are not the only tools in a marketer’s toolbox. But used in conjunction with other outreach channels, they can generate fantastic results, or rescue stagnating campaigns. Disabled American Veterans (DAV) of Minnesota found that out when the non-profit added digital direct mail to its one-shot, automated call outreach strategy that had long passed its prime. With response rates topping 1%, the mailings have worked with the phone efforts to drive DAV MN’s revenue over $2 million — an eye-popping number for this supposedly “unknown” regional charity. In 1925, the Disabled American Veterans of Minnesota was commissioned to invest in Minnesota veterans and their families in ways that would enable them to lead high-quality lives — with respect and dignity. Structured similarly to other fraternal veterans’ service organizations, such as the VFW or the American Legion, the DAV of Minnesota was established as a 501(c)(4) nonprofit, chartered to provide an expanding variety of services. That includes representing and advocating on behalf of veterans and their families within federal, state and local legislatures; providing benefits counseling; providing emergency-relief funds; and providing grant money to support other DAV services throughout the state. Despite that, DAV of Minnesota isn’t well-known; primarily because it doesn’t have an established presence in communities throughout the state. Online content, while ideal for information, cannot be used for solicitation, because it would likely reach people not directly related to the organization, and that goes against DAV’s guidelines on geographical boundary restrictions. This limited DAV of Minnesota’s options to grow its brand and spread its mission. Identifying the availability, and assisting in the distribution of, gently used durable medical equipment. Joshua Vrtacnik, deputy adjutant and director of operations of the Enterprise Program, oversees the collection and resale of second-hand items, which provides funding for its expanding veterans’ transportation network. The transportation fleet has grown from nine to 22 vehicles in the last three years and now services Northeast, Northwest and Southwest Minnesota. In 2015 alone, volunteer drivers traveled more than 1.7 million miles to transport more than 24,000 veterans to and from doctor and hospital visits, at no charge. It has a massive impact on the lives of its beneficiaries. The personalized mail reminder postcard program is directly responsible for growing revenue by 10% over automated calls alone. DAV MN initially marketed the Enterprise Program through automated call centers that alerted residents of when a collection truck would be in their area. The success of these tactics was bolstered by positive public perception of the military, and Millennial affinity for sustainability issues. Polls conducted in 1947 and 2013 indicate a significant share of the public has come to believe soldiers deserve more than what they get: 78% of adults believe members of the military contribute a lot to the well-being of society, and a high percentage of Americans are willing to donate to charities with a military-related mission (more than $2.5 billion is donated annually to the more than 40,000 American military charities). A 2015 Nielsen study found Millennials to be the most willing generation to pay extra for products with a sustainable component. In addition, the nature of the programs — which reuses donations people might consider “junk” to aid those veterans — fit a green platform of reduce, reuse and recycle. The format of DAV of Minnesota’s approach tapped into public sentiment on these fronts. However, it still found the Enterprise Program stagnating. DAV of Minnesota measured effectiveness by the number of pick-ups made per zone following the automated calls, and those numbers were not improving. Not surprisingly, it found weather, season and holidays had a distinct impact on donations. Perhaps the sheer number of organizations helping veterans and desiring donations was also having an impact? Either way, in order to survive, DAV of Minnesota would need to find a way to stand out. To improve response rates and level the donations across the year, the organization knew it would need to augment its current nonprofit marketing plan. 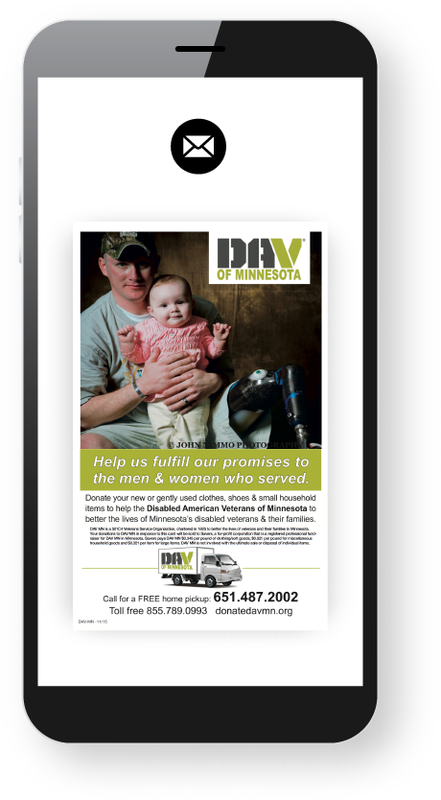 After considering a number of marketing channels, DAV of Minnesota saw direct mail as a way to follow-up on the automated calls and close the gap on its donors’ journey. Direct mail postcards offered many benefits, especially the ability to target donors in the same areas the automated calls were hitting. For DAV MN, it allowed all of the nonprofit’s marketing plans to focus on specific areas at specific times. As a nonprofit, DAV of Minnesota is also obligated to be mindful of the cost of any marketing programs it chooses. So in order to reduce the outlay for printed materials, it pre-printed shells that could be filled in with specific information when it was time to launch the next campaign. As needed, these personalized mail shells were imprinted for specific carrier routes (matching the area of the automated calls) and sent to residents two to three weeks after the calls. The direct mail postcards’ message was simple but effective: A reminder of when the collection trucks would be in the area. One of the main advantages of direct mail is that mail recipients read it at a much higher rate than other channels. According to USPS’s research “The Household Diary Study: Mail Use & Attitudes in FY 2017,” 74% of mail recipients at least scan advertising mail. Most, 53%, take the time to fully read advertising mail. Only 24% of advertising mail recipients throw it out without at least looking at it. So DAV of Minnesota could be confident that the follow-up message would get into the hands of its targeted audience. With the first mailing, DAV of Minnesota saw an immediate increase in donations that Vrtacnik could attribute to receiving a tangible item — the postcards — recipients could pin up within their home. This physical reminder component is another benefit of direct mail. Other marketing vehicles, such as calls and text messages, are done as soon as personalized mail is delivered. The mail pieces stayed with recipients to remind them when the next pick up was coming. The results were consistent and continually improved, but the preprinted shells were not without issues. When DAV of Minnesota changed its logo and brand color, the entire direct mail inventory became unusable. The organization had been forced to stock a six-month inventory of the old direct mail shells, which led to significant waste. DAV of Minnesota looked to a new solution. Digital printing offered cost effectiveness, a shorter lead time, customization capabilities, instant design changes and shorter print runs of personalized mail, compared with the old method. In 2016, DAV of Minnesota partnered with the printer Impact — not least because the partner was local to Minnesota. Impact’s pricing was extremely competitive at the scale DAV of Minnesota required, but the printer also demonstrated it was responsive, dynamic, flexible, and up-to-date with new technology and direct mail offerings. Using digital printing brought the new personalized mail pieces to life. It gave the direct mail postcards a personality and established a recognizable brand for DAV of Minnesota that literally stuck in the recipients’ homes. Impact produces more than 75,000 full-color, direct mail postcards each month, which are mailed about a week before collection trucks are scheduled to visit an area. With color and customization, the 5”x8” follow-up postcard has been designed to prompt the recipient to set an appointment for a donation pick up, either online or by phone. If the personalized mail recipient is more of a DIYer, the piece also includes a variable-printed map to a drop-off location near their home. Additional messaging, such as types of items accepted and the nonprofit’s mission, are also included. Variable data printing was used to personalize the map (there were three, depending on the recipient’s ZIP Code) and the pick-up date. The date is very specific to each route and scheduled up to six weeks in advance. 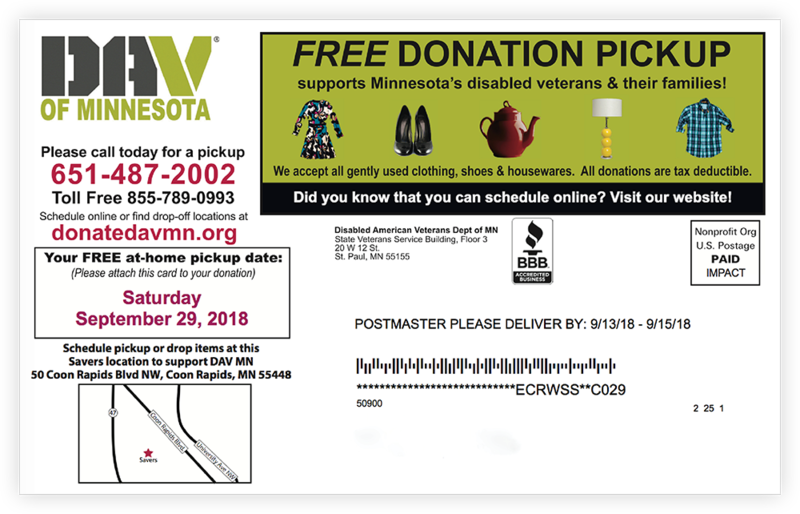 Last year the DAV of Minnesota, chapter volunteers, and metro fleet collected approximately 10 million pounds of items to be repurposed or recycled and, according to Vrtacnik, the personalized mail reminder postcard program is directly responsible for growing revenue by 10% over automated calls alone. 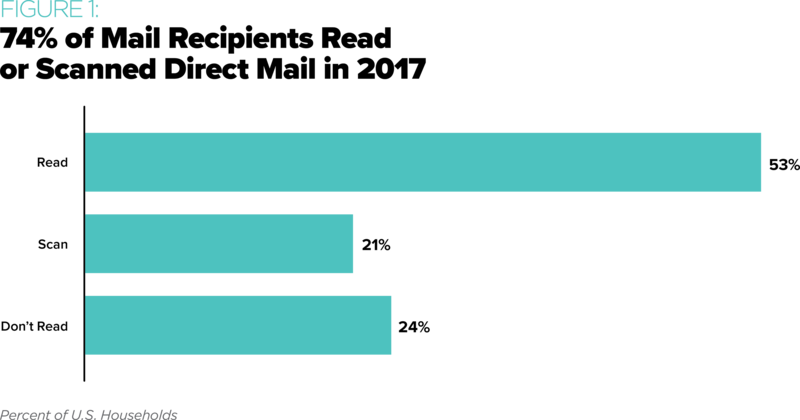 Much of this response rate growth is attributable to variable data and USPS’s Informed Delivery — a program that allows mail recipients to sign up to see a digital preview of mail and package deliveries to their mailboxes via email notifications. The combination of the two has helped in strategic areas: improved engagement, increased donations and cost reduction. Notification emails from the USPS’s Informed Delivery — some of which are seeing 70% open rates — allows consumers to see each mail piece multiple times, giving it more chances to make an impression. Four-color print has made DAV of Minnesota’s personalized mail pieces more interesting and more likely to catch the reader’s eye. It also has created brand recognition and is building an association between the brand and the cause. 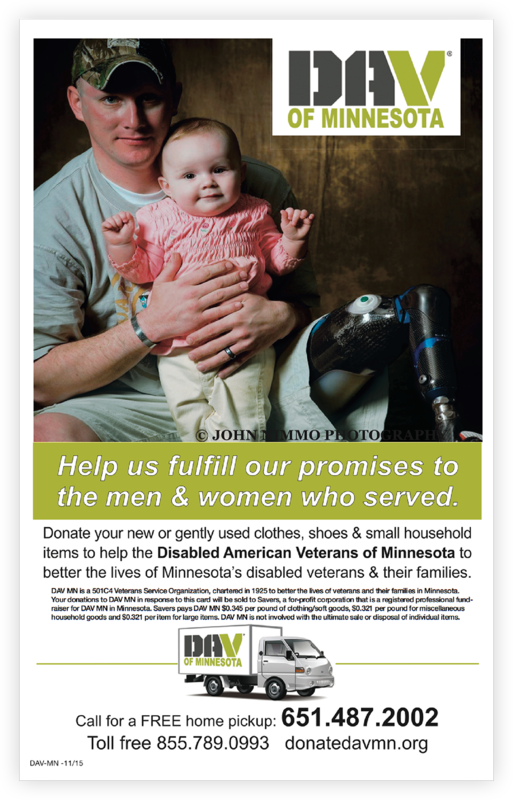 A physical postcard, unlike other marketing vehicles, can be kept and displayed, which keeps DAV of Minnesota top-of-mind as people choose items to donate. Variable-printed drop-off map locations have led to more donations at collection boxes in the targeted area, and Informed Delivery has reduced direct mail print and postage costs through the development of a resident-saturation file. That means residents with no response history are eliminated from future mailings, while neighborhoods with high response rates remain targeted. Additionally, with data analytics provided by the Informed Delivery program, DAV of Minnesota will gain a better understanding of the ebbs and flows of direct mail response rates, especially by area, and will be able to more efficiently plan truck routes and the number of trucks needed. This reduces not just time on the road for these drivers, but also fuel costs. Recipients who choose to book a date online will find color images to click and this visitor data is tracked, as well. According to Vrtacnik, the mailings average a 1% response rate — depending upon the weather — and have helped the DAV of Minnesota reach more than $2 million in annual revenue, and realize an overall budget savings of approximately 5%. Six years ago, the DAV of Minnesota had eight vehicles providing no-cost transportation services to Minnesota veterans. Now it has 24 — and DAV MN hopes to have 32 vehicles by the end of 2018. With increased revenue, the organization has been able to expand into Greater Minnesota, and south into Rochester and Sioux Falls. Revenue not used by the chapter is sent to the DAV of Minnesota Foundation and placed into the charitable giving arm in order to provide other veteran services throughout the state. Using direct mail has been a win — not just for the DAV of Minnesota, but also for veterans and their families across the entire state.